Hongcun is a small village a couple of hundred of km west of Hangzhou in the historical Huizhou region of southern Anhui. It was first established in the Song dinasty and experienced its best time during the Ming and Qing dynasties. 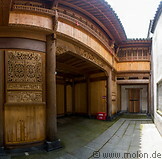 Its main attraction are the very well preserved old Chinese houses and mansions in a picturesque countryside setting. Tourists pay a fee of 104 RMB to get into the village. Together with Xidi, Hongcun has been a UNESCO World Heritage site since the year 2000.